Happy World Book Day 2018! Well, it’s a little belated, as World Book Day was officially just over a week ago. But it seems like a lot of schools delayed their celebrations due to the snowy weather. For myself, I’ve had a busy World Book Week, visiting five schools since last Thursday. I just wanted to share some of my highlights from the past few days. Some of the amazing Isadora Moon World Book Day Costumes people have shared! I’m absolutely stunned and delighted by how many children and parents put so much effort into bringing Isadora Moon to life. I would love to showcase them all, but above are just some of the ones I have seen! Thank you so much to everyone who took the time to make and share their costumes. I was especially thrilled to see that one little girl in her Isadora Moon costume even made it into The Times! Isadora Moon made it into The Times! Isadora Moon, I think, has quite the enviable wardrobe collection! 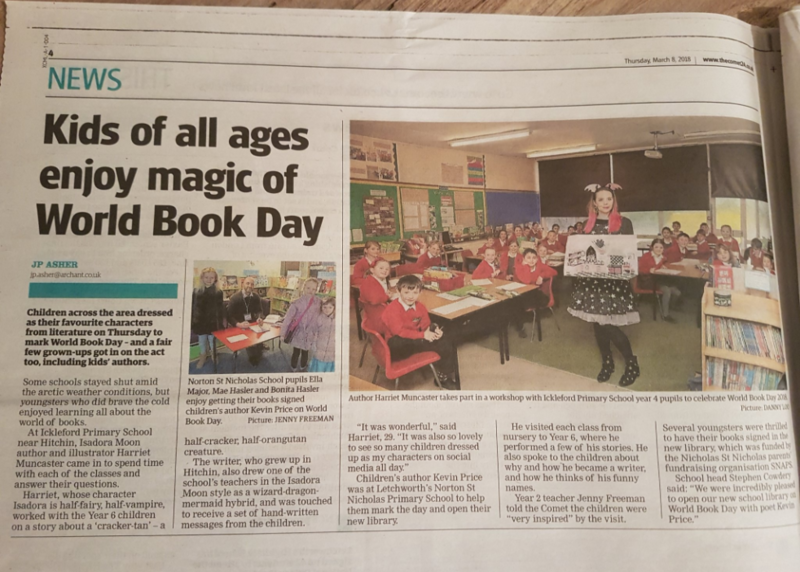 Ickleford Primary School invited me to spend World Book Day with them back in October. My mother used to work there, and my grandmother is a priest at the local church and does assemblies there from time to time, so I already have links with the school. I was more than happy to accept their invitation. We spent the day making up hybrid characters, putting them into stories, and learning how to draw characters from Isadora Moon. In the afternoon, the local paper, The Comet, sent along a photographer, so I got a little mention there as well. You can read the full story, and see more pictures on The Comet’s website. I don’t even want to go into detail about this creature, so I’ll just let the picture speak for itself! On Tuesday it was an early start and off to Ipswich for my last school visit before Easter. This was meant to be a week earlier, but we had to postpone due to the weather warnings. I felt bad about it, but less so when I found out they had two other authors booked in for the same week to see the older children, and all three of us to postpone. I did five workshop sessions with the year 1 and 2 children at Broke Hall School. My picture was featured in The Bookseller’s Pictures of the Week following Isadora Moon Day. Catherine, aka The Bookish Mummy, is someone I know from my local Waterstones. She also has a little boy a similar age to Celestine. So we popped round for a play date and an interview. She’s done a wondeful write-up of the interview, which you can read on her blog. This little girl wasted no time in putting together her own Isadora Moon Mini Books! In a recent blog post, I shared the Make Your Own Isadora Moon Mini Books activity. Within literally hours one mum shared the above picture with me! I’ve seen quite a few of these now and I’m glad they’re going down well. As you know, I love cute tiny things, so any way to put more of them into the world makes me happy! Snow or no, I hope you had a wonderful World Book Day. I was very briefly wondering the other day if World Book Day was a UK-only thing, or in other places too. After a few seconds’ deliberation I realised… the clue’s in the name! It’s a bit early to start thinking about next World Book Day just yet, but if you’d like me to visit your school, please check out my schools page.